I think this is a good starting point for those of you who are keen to go with the Traditional weaning. Works for other fruits too and I like how it's got pictures! Homemade pear puree is sweet, filled with fiber, and rich in vitamin C. Follow our easy step-by-step instructions to make this ideal first food for your baby. Bartlett pears are an ideal first fruit for babies - they're nutritious, soft, mild, and sweet. In late summer, peak season, pears may be so ripe that you don't have to cook them before you puree them. 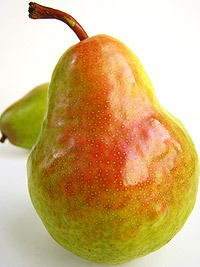 The ripest pear will smell sweet and have a yellow color that may or may not be accented with a rosy blush. Look for fruit that's firm and free of bruises and other blemishes. One medium pear yields about five ounces of puree. 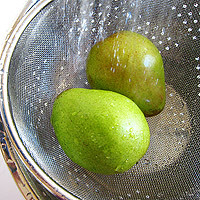 Wash pears with a mixture of three parts water and one part white vinegar to remove bacteria. Rinse under cool running water, dry, and peel. 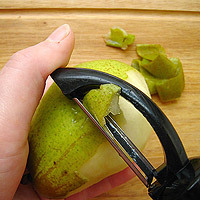 The easiest way to peel a pear is to use a vegetable peeler and work in a circular motion around the fruit. If you do not have a vegetable peeler, use a sharp paring knife. Set the peeled pear, stem side up, on a clean cutting board. Slice in half, lengthwise. 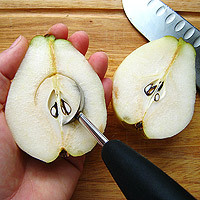 To remove the core, cup each pear half, one at a time, in your palm and cut in a shallow scooping motion with a paring knife or melon baller. 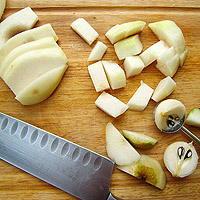 Once the core is removed, finish slicing the pear into equal-sized slices and then quarter each slice. If your pear is ripe, skip this step and move on to step 5. If you?re working with pears that aren't fully ripe, place the fruit in a steamer and cook for 3 to 5 minutes or until tender. 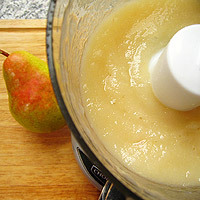 Puree chunks of pear in a food processor or blender until smooth. 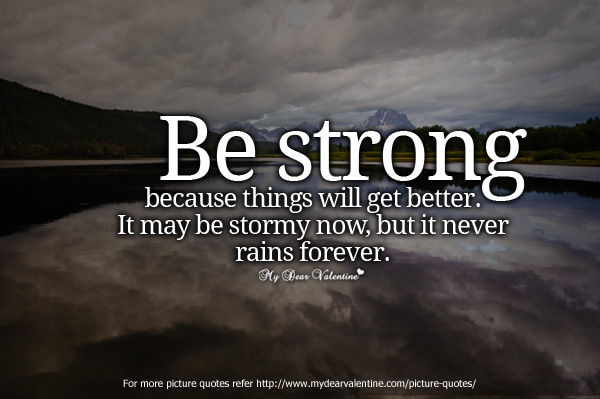 Add water as needed to reach desired consistency. 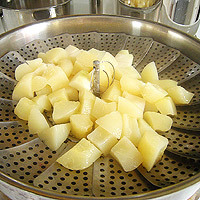 For chunkier pear puree, which is ideal for babies 10 months or older, mash the pear with a potato masher instead of pureeing it. 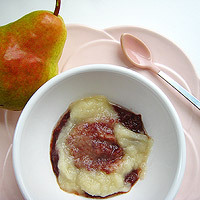 Pear puree is sweet and mild. Serve it plain or mix it with another puree or two to introduce your baby to new flavors and textures. Cool pear puree and refrigerate leftovers in BPA-free containers for up to 3 days. Freeze leftovers for up to 3 months. Thaw overnight in your refrigerator.